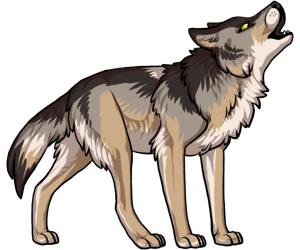 Wolves are the ancestral species to dogs and coyotes. They primarily live in Alaska and Canada. Some of them live in northern United States, around the Mexico/Texas border, as well as Russia, few eastern European countries. Today most packs of wolves have up to 12 members. The primitive wolf closely resembles the modern wolf populations in the Arabian Peninsula and South Asia. Primitive wolves weighed about 40lbs and were known to exist as many as 500,000 years ago. The wolf is the largest in the wild canine family. The wolf has one of the widest ranges of size, shape and color of any mammal in North America. The wolf lives in a pack, family oriented social structure with a dominant male, an alpha female and several beta wolves. There is typically only one breeding pair in a pack of wolves.